Posted March 19th, 2019 & filed under All About Foods. Before moving to discuss the similarities and differences between bee pollen, propolis, and royal jelly, we just want to give you a brief overview of these substances. 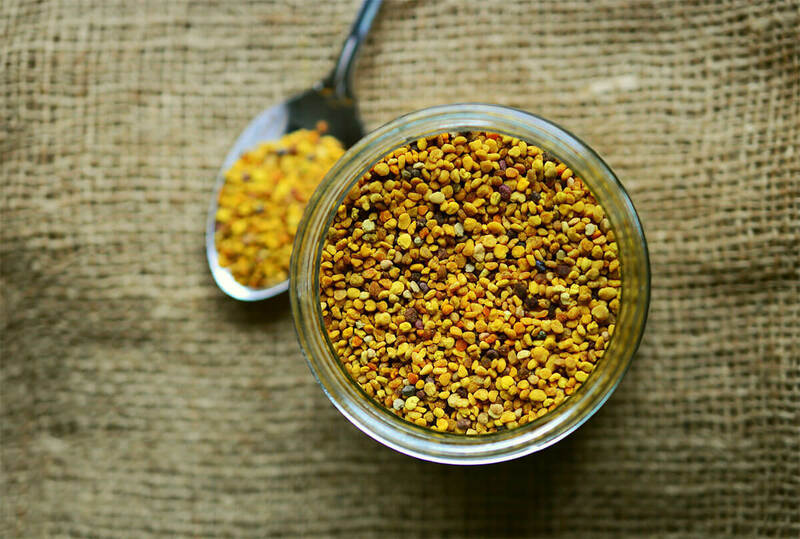 Bee pollen is the composition of different substances such as honey, flower pollen, wax, nectar, enzymes, and bee secretions. Honeybees collect this substance from plants and carry it to the beehive, where it is put in storage to be used as food for the honeybee family or colony. Propolis is a resinous material manufactured by bees from buds of cone-bearing and poplar trees. Honeybees use propolis to construct their hives. There are various commercial applications of propolis such as medicines, health therapies, cosmetics etc. Royal Jelly is a glutinous or jelly-like substance produced by honeybees. It is used to feed the queen bees. The primary benefit of royal jelly is its usage in dietary supplements, where it is used to treat different chronic diseases and physical ailments. Let’s now discuss the similarities and differences between these three bee products! Bee pollen, propolis and royal jelly are all ingredients derived from bees that are often marketed as traditional medicines. While the three come from hives, they are produced and used in different ways by bees. Affirmations about their effects on human health are controversial and research on their effectiveness is inconsistent. Bee pollen is known as “Food of Life” because it contains eighteen different amino acids and essential vitamins. It also contains copper, calcium, potassium, iron, phosphorous, carbohydrates, fatty acids, and proteins. Likewise, the composition of royal jelly contains an internal membrane protein known as acetylcholine, a neurotransmitter that enables the nervous system to transmit important messages from one nerve cell to another. One similarity between bee pollen, royal jelly and propolis is that they all contain a wide variety of essential compounds such as vitamins, proteins, carbohydrates, and proteins. Royal jelly and propolis have indisputable benefits for a sore throat and cough. The first one produces more of a balsamic function, and the second one is more antibacterial, ensuring that it does not go any further. In the respiratory tract, it is a natural and anti-flu antibiotic thanks to its anti-inflammatory and anesthetic action. While Royal jelly and pollen is best taken in the morning, the propolis can be taken at any time of the day, and several times if necessary. Bee pollen is promoted as a nutritional supplement that is said to improve athletic endurance. It is also used to treat a variety of conditions, including constipation, aging and wound healing. Propolis is marketed as an anti-inflammatory with anti-tumor and anti-oxidant characteristics. Royal jelly has been studied for many of the same uses as bee pollen and propolis and is also considered capable of effecting lipid profiles and has neurological and estrogen effects. Claims for nutritional benefits of bee pollen have not been verified by scientific research. Royal jelly has been observed to have some of its purported affects, but it has not been vigorously tested in clinical trials. Propolis has presented antimicrobial and anti-tumor properties in laboratory tests but has not been subjected to large-scale clinical trials. What is a measuring spoon?